A catchy song to work with vocabulary and to talk about attitude towards adversity. I hope you like it as much as me! This time I�ve made a video with a song: �SMILE� by Nat King Cole. There are 7 exercises. You can watch the video, listen to the song and do the exercises. Have fun!! 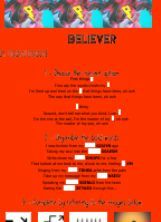 The title song from Sue Thomas F B Eye to develop listening skills. Easy to learn. the song combines a general idea of people emotions and their way of life. Great ballad by Slipknot. My students like this song a lot, so hope your students enjoy it! it�s an exercise to pratice listening. Also this singer is the new fever in Brazil, so most teenagers will enjoy doing this exercise and actually understanding what she sings. The videoclipe should be used as the song player. 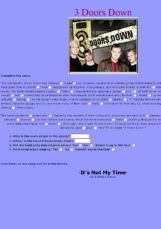 3 Doors Down Exercise with Song "It�s Not My Time"
A brief background story activity on the rock band "3 Doors Down" with the song "It�s Not My Time". 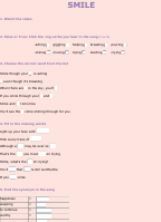 Link to the acoustic video of the song "king of pain" and fill in the gaps according to what you listen to.